Hafeshwar Mahadev, a Shiv temple, only recently reappeared. We know there is always an element of chance with photography; right place, right time, the decisive moment, and all that palaver. Yet sometimes an un-staged photograph has such perfect balance that it looks almost like an illustration. This photograph is a good example. The twisted, bare branches perfectly frame the reflections of the domes. Those white domes pop out against the irregular line of the mountains. The red of the man’s clothes correspond to the colours of the god and goddess. The darkest areas are evenly balanced. The diagonal and vertical lines lead our eyes on an easy journey around the image; but you know all that. The important thing is that Nevil Zaveri was able to take this picture. As I mentioned at the outset, the temple of Hafeshwar reappeared only a few months ago. For more than two decades this photograph would have been impossible, as the temple was submerged. Then when the drought in Gujarat caused water levels to drop, folks came out, and proudly started to paint the domed rooftops as they re-emerged. The twisted branches of leafless trees reappeared. 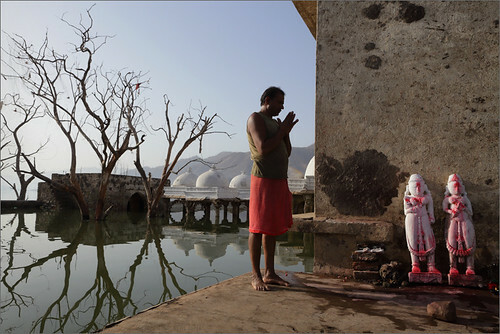 People came to pray, and Nevil Zaveri took this photograph. Almost twenty-five years is a seriously long time to wait for the decisive moment.